Sophie’s choice in study stemmed from her fascination in how timeless and extensive the field of geology can be. The travel opportunities that come from studying the earth was also a big motivation, for someone who loves the idea of an international career path. Getting around New Zealand through UC field trips has been a good start to her goal. Joining student clubs on campus was also a great way to build on her expertise in Geology with fellow students. She also takes part in UC Sport team competitions having been a netball umpire for nine years, currently within the Christchurch Netball Centre. During the final year of her undergrad, Sophie gained an internship with Environment Canterbury through the ARTS 395 course, finding new and old springs in the Fairlie Basin and recording their characteristics in a database. Starting at UC not long after the Christchurch earthquakes, Sophie found that she also had an interest in the effects of natural disasters, which lead onto her Master of Disaster Risk and Resilience. ‘Why not take advantage of the perfect case study opportunities? I was motivated by my passion for rocks and the land as well as disasters and helping people,’ she says. ‘I want to have an involvement in the reduction of disaster damages and the preparation for future disasters. Sophie has appreciated the support here, and made use of the Academic Skills Centre and Disability Resource Service throughout studying, saying they ‘are both super accommodating’ at helping with assignments and workloads. 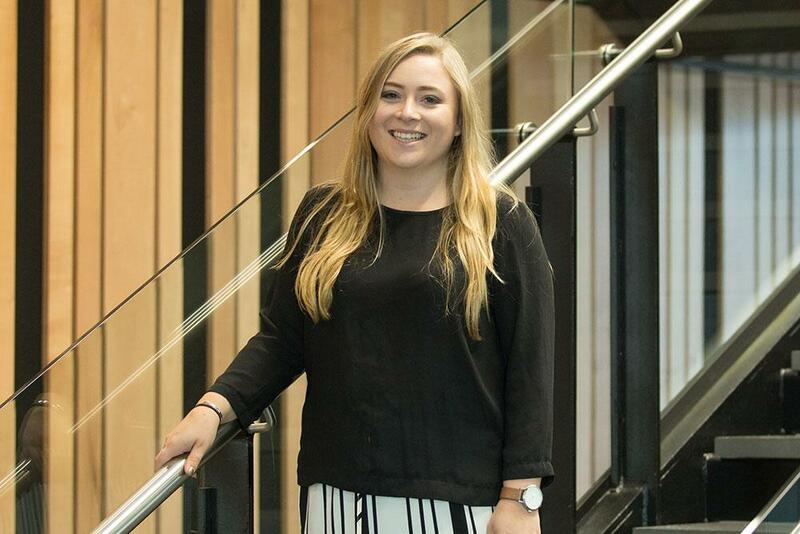 She gives back to UC as a Residential Assistant with University Hall, a role that supports students living on campus and organising hall events.